BIA/Kelsey forecasts U.S. social media advertising revenues will reach $9.2 billion in 2016 -- that's up from $4.6 billion in 2012, representing a compound annual growth rate (CAGR) of 19.2 percent. According to the finding from their fall update, the local segment of U.S. social media advertising revenues will grow from $1.1 billion in 2012 to $3 billion in 2016 (CAGR: 28 percent). "The year 2012 can be viewed as social advertising’s coming of age," said Jed Williams, program director, social local media at BIA/Kelsey. The continued development of native ads, such as Facebook Sponsored Stories and Twitter Promoted Tweets, and the acceleration of mobile monetization will be the primary drivers of social advertising growth through 2016. BIA/Kelsey defines social media advertising as money spent on advertising formats across social networks. Social display advertising will continue to account for a higher percentage of revenues, due in large part to Facebook’s Marketplace Ads and YouTube’s multiple display units (video, traditional banners). Spending on social display advertising will increase from $3 billion in 2012 to $5.4 billion in 2016 (CAGR: 15.2 percent), according to the forecast. BIA/Kelsey expects robust growth during the forecast period from native social ad formats, which are emerging as viable display alternatives. The firm defines native social advertising as branded content integrated within a social network experience (e.g., the newsfeed or content stream). Spending on native social advertising will grow from $1.5 billion in 2012 to $3.9 billion in 2016 (CAGR: 26 percent). Growth will be driven by the higher premiums native social ad units command. The forecast also identifies mobile as a key growth area for social media. 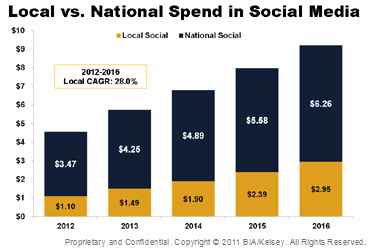 BIA/Kelsey estimates social-mobile advertising revenues will increase from $500 million in 2012 to $1.5 billion in 2016 (CAGR: 28.5 percent). A variety of forces will influence this growth, including rapid social-mobile consumer usage growth, active experimentation by vendors and deep integration of native ad units on the platform.